In this blog I will be concentrating more on creating and adding plugins (barcode scanner) to a cordova applications, rather than explaining SAPUI5 coding (I am sure that nobody needs simple button click functionality to be taught in sapui5….. 🙂 😀 ). For packaging of sapui5 application with phoneGap refer my previous blog Packaging sapui5 application using phoneGap for Android . There are some confusion about phoneGap and cordova, as far as codebase is concerned there is no difference between them. Phonegap is a command that encapsulates cordova, major difference is that phonegap has a remote build capability whereas cordova supports local builds, you can find more information about this here . In this blog I will create cordova application and add barcode scanner plugins to it. Download and install nodejs from here. all possible npm related commands are listed here. To install cordova execute “npm install -g cordova”. now you can execute “cordova” command to see if it is installed properly, you should see all the cordova related commands. 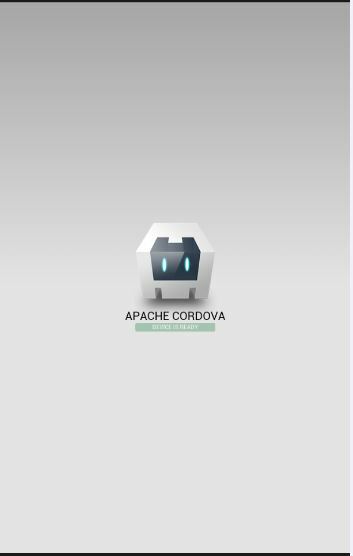 Once cordova installation is confirmed, execute following command to create cordova project. Execute command “cordova run –device” or “cordova run –emulator”, application should start on device(or emulator) as shown in the following screen shot. Now coming to the barcode part, you can download barcode scanner from here, supported barcode formats are listed in the same page. where PATH is a location of barcodeScanner plugin,it may be downloaded location or it can be git repository location. To copy it from a git repository “GIT” command line tool should be installed in your system. You can install it by executing the command “npm install git”. After installing barcode scanner plugin, you can call the following function to scan the barcode from openUI5 or sapui5 code. To package your sapui5 application, simply copy index.html and related .js files from www folder of your sapui5 application and paste it in a www folder within barcodeScanner folder and add reference to cordova.js file in index.html. simply copy index.html and related .js files from www folder of your sapui5 application and paste it in a www folder within barcodeScanner folder and add reference to cordova.js file in index.html. I tried to put the WebContent of the fiori tutorial (10 exercices) in the cordova www folder, added the reference to cordova.js in the index.html, but all I get is a blank screen. Any ideas? Its probably a reference issue, copy and paste the index.html in www folder (out of webcontent) of cordova, and also change the reference of all the files as webcontent\view\viewName.view.js .In fiori tutorial they are referring to local resources, in that case copy resources from sapui5-static.zip into www folder. For debugging, execute the command “cordova serve 8000”, now you can access your application in browser using http://host-ip:8000/android/www/index.html. Use chrome developer tool (press F12),it shows the error in console. And haven’t got it working yet, but you were right, the sap-ui-core.js was missing. In the debug window I can see the 404 error code. I was added fiori 10 exercise file into cordova www file and I too getting blank page. Any update in your cordova? Do you got output? Very Helpful. Thank you so much for sharing this blog. set registry = http://registry.npmjs.org/ But no luck. I doubt if it is a proxy issue, as you are able to install node and cordova. “cordova create” command will not make any request to the repository, instead it will copy the project structure from a installed files. Try executing command cordova, it should give you a bunch of command suggestions, let me know if you are able to execute this. Yes, I am able to execute cordova command and it does give me a bunch of command suggestions. Attaching the screenshot herewith. omitting “-g”. Try creating cordova project from this. I followed your instructions but still no luck. Getting the same issue. Cordova intallation gave me 200 ok and 304 codes…didnt get any ERR!! Hopw it is a successful installation. Open your .npmrc file in notepad and check if proxy setting is proper there. I dont see the proxy setting in my .npmrc file. I searched for the extn and found 3 files. i searched in npmrc.md – but not finding anything here. Not sure if i am looking at the correct file. can u pls help. I followed your steps now, even copied all files to www folder from SAPUI5 application, but i am getting SAPUI5 Libraries conflict i.e. ‘sap-ui-core.js’ and ‘sap’ is not defined. I have copied everything from WebContent folder of SAPUI5 application to www folder of cordova application. I guess my ‘resources’ is missing many files. Can you please tell from where I can download ‘resources’ folder? Thanks Vijaykumar Ratnakar for this blog, it looks very promising! I wonder: have you or Ferry Gunawan ever user phoneGap Build for this kind of feature? I am looking to include a bar-code scanner in an iOS app, but as I don’t own a Mac I cannot use the command “cordova platform add ios“, like you did for android. Are you aware of how we could use the barcode scanner plugin for phonegap build to produce the same results you have above (and in Ferry’s article) but for an iOS application built on a windows machine? I believe one of the difficulties is that we need an iOS signing key, but it seems that you can generate a key in this way, without need for a Mac. If this is the only thing we needed in order to build an iOS app, then we don’t need a Mac, if we can use phoneGap build rather than building the app locally, as you have shown above.. is this your understanding too or have I misunderstood? Does this make sense? Is this something either of you have tried before? I would really appreciate your comments on this. A simple answer is yes you can build iOS apps without MAC using PGB, but still you would have to purchase developer license from apple and convert it to P12 file. Finally upload P12 file to your PGB account. I need to use Bar code scanner in my simple SapUI5 mobile app. Can you please give me the proper index.html and related .js files? Can you try remove and add platform, it looks like your platform files are not copied or generated properly. Do let me know. Can It possible to use this “Cordova” plugin with simple “Sapui5” web app just for mobile devices? My main requirement is to implement scan functionality to simple “Sapui5” web app for mobile devices. May be previously “BarcodeScannerButton” is already present in Sapui5, but in new versions it might be removed. I followed the steps which is mentioned in this blog, but i am only getting the image which shows Device is ready. I tried using browser and also through apk file. Please let me know where i am missing. I try to barcode scanner with cordova and sapui5 but I couldn’t submit project Sap Server as BSP App. Is it possible for me to use blutooth enabled barcode reader with your application ? Kindly hepl me in this regard .